Gertie’s Nose Knows … GREAT HOLIDAY GIFTS! Nov 11, 2009 – Westland, Mich., — Michigan based Gertie Gear™ is the gift that keeps giving ... support and style! The American Kennel Club (AKC), the nation’s largest, oldest and most prominent organization for canines and breeders agrees. Gertie Gear pet air beds didn’t just make the exclusive list of only 18 AKC recommended “best gifts” for 2009. 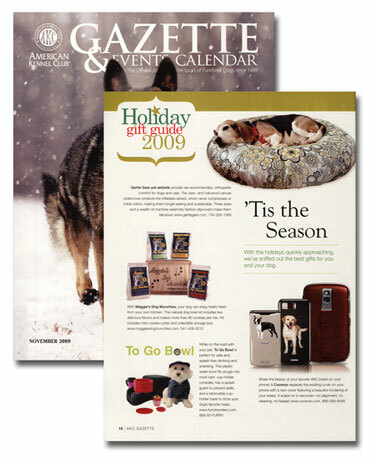 The special holiday gift guide of the November AKC Gazette and AKC Family Dog magazines positions “Gertie” (the senior beagle that inspired the line) and her orthopedic, yet fashionable and sustainable pet air beds as the #1 featured item. Breeders and dog enthusiasts look to the AKC (and “Gazette”) to set the standards for canine breed characteristics. Gertie Gear is raising the standards for pet beds by providing a solution that is better for your dog or cat, home decor, and in the long run, your budget and planet too. Veterinarians and other pet professionals recognize the Gertie Gear air bed for the orthopedic support it provides, and pets love the comfort of the natural nest which conforms to their body. Conventional pet beds stuffed with polyester or other filling, including expensive orthopedic memory foam beds, compress and/or decompose quickly, especially with regular washing. Gertie Gear pet air beds never compress and both the outer slipcover and claw/nail-proof canvas inner cover are machine wash and dry, making them easy to keep clean and free of odors and allergens. The thoughtfully designed details of the Gertie Gear air bed, like the extra wide zippered canvas and quick-change elastic fitted slipcovers make them easier to use and they outlast other beds several times over. Julie King, designer of the innovative pet air bed system and owner/marketeer of the brand, created the bed for her aging beagle, “Gertie.” A veteran creative professional in Detroit’s advertising community, the designer launched the Gertie Gear brand in conjunction with her award winning creative services agency in 2008. “As a child of an engineer, I’m always formulating ways to make things more efficient and effective, while maximizing value and resources. As a designer, it’s equally important for products to have a pleasing aesthetic that adds to and works with a home’s décor and owner’s personal style. Pets are part of the family and pet beds can be a sizeable element of a room, so they deserve the same consideration as a chair or any other piece of furniture,” says King. Available in three sizes, the wide array of slipcover choices range from simple function to high fashion, but all are hand-crafted in Michigan by American workers using apparel fabrics chosen to withstand regular use and eliminate special care in the laundry. From fun cotton and flannel prints to embellished micro-suede and cozy fleece, Gertie Gear has a pet bed to fit any style, decor or even season. A Gertie Gear air bed is not only the perfect gift for pets. $1 from the sale of every pet air bed set (and select replacement covers) is donated to Animal Rescue New Orleans (ARNO), in support of the all-volunteer organization’s efforts to help area animals and their owners STILL in need years after Katrina. “Why ARNO? Well, let’s just say we have a soft spot for ‘underdogs’,” replies King. For more information and holiday shopping, please visit www.GertieGear.com and/or become a “Gertie Gear” fan on Facebook. CLICK HERE to see the entire gift guide in the online version of the AKC Gazette.